Home » Patient information » Want a #free toothbrush? Heres an offer too good to miss! During August 2015 we are giving away a free toothbrush when buying 2 packs of Tepe interdental cleaning brushes. Your regular toothbrush only cleans the front, the back and the biting surface of the tooth. Don’t forget to clean the surfaces between the teeth, where the bacteria hide. There are several ways to carry this out depending on the size of your gaps and what you prefer yourself. The most effective method is to use an interdental brush. TePe offers interdental brushes in up to nine sizes to fit different interdental spaces. – TePe Interdental Brush Original: straight brush head, short handle, nine sizes. 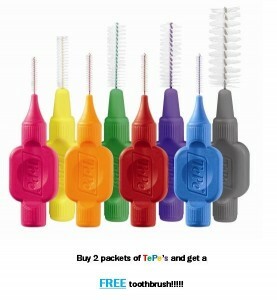 – TePe Interdental Brush Extra soft: straight brush head, short handle, extra soft filaments, six sizes. – TePe Angle™: Angled brush head, long handle, six sizes.